Fire explorers being trained to fight wild fires. KCLU's Debra Greene reports from the front lines, where she sees the firefighting training in action. More than a hundred young people from across California and Nevada just wrapped up a week of training on the South Coast to become firefighters. Flames crackle and dark smoke rises as a fire burns in a grassy area just above Cal State Channel Islands in Camarillo, with a helicopter coming to the rescue. 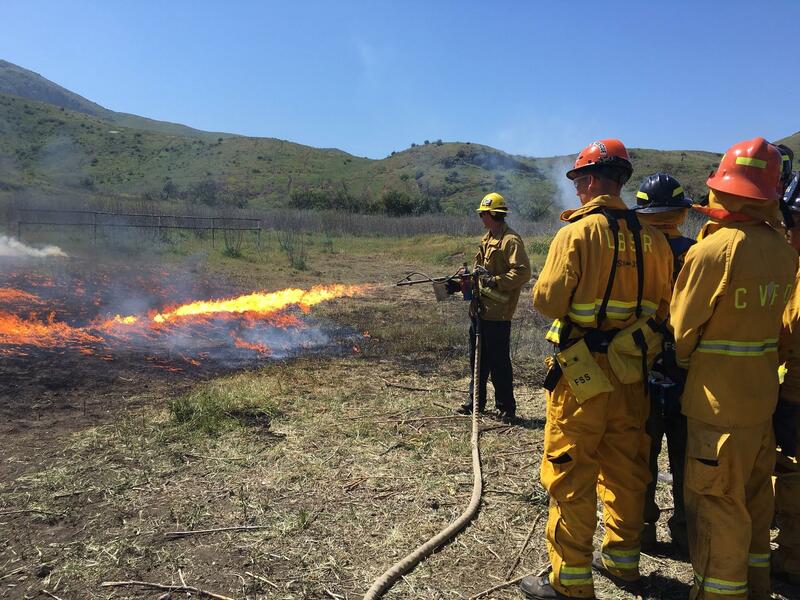 What looks like the scene of a real brush fire is a training exercise for 15- to 21-year-olds who want to become firefighters. “I want a job like that where I can get to serve with the best and serve my community,” said Michael Nyberg, who is one of 150 Explorers in this California Fire Explorer Academy. The group is learning how to battle all kinds of fires, including wildland fires -- everything from fire prevention by cutting down tree branches to controlling fires by using firing devices. “They get to really see what it’s like and see if it’s something they want to devote their life to,” said Oxnard Firefighter Marshall Devorin, whose department hosted this year’s Academy. This training has inspired Nyberg to pursue his dream. “Integrity, team work, courage. It’s a lot deeper than just putting water on fire," he said.